The Wylie Bay Waste Management Facility has been in operation since the 1980s. It includes a Community Drop-off Point, Materials Recovery Facility (MRF) and Class II landfill. The current landfill site is approaching the end of its operational lifespan and has a licence expiration date of 31 December 2022. A new landfill site needs to be secured and constructed prior to the imminent closure of the Wylie Bay site. The Shire commissioned Talis Consultants Pty Ltd to undertake a site selection study with the objective of selecting a suitable site for a modern Waste Management Facility. Information on the process undertaken and the results from the studies are available for your review below. Council determined in a Special Council Meeting held on 19 February 2018 that an independent review of all currently available hydrogeological investigations and associated reports, including the Phase 2 Hydrology Risk Assessment report from Talis be undertaken. Consultants Pennington Scott were requested to conduct this review. Their findings are below. Additionally Talis Consultants have read this report and provided a response, this is also available below. The Shire is currently collating information for assessment from the Environmental Protection Authority (EPA). The approval process requires intensive investigative testing and research with a pump test being one of the requirements. A pump test is a method used to determine the grounds ability to store and transmit water. It consists of pumping groundwater from a bore (usually at a constant rate) and measuring the drawdown in nearby monitoring bores during and after pumping. From these results the speed of groundwater movement can be measured. More information on a pump test is available here. During the February 2019 Ordinary Couoncil Meeting, Council resolved to proceed through the PER process in a priority order of works. Once each priority is complete, the results are presented to Council and then released to the public. The Greater Sports Ground Redevelopment is a long term plan for the Greater Sports Ground. It will allow for continued growth and accommodation of the multi-sports activities that utilise the facilities and open spaces and the co-location of a number of significant sporting groups. The changing needs of a diverse community will inform and determine future development of this central sporting area. Within the Greater Sports Ground the redevelopment of the Esperance Indoor Sports Stadium has been identified as a priority project. This Project is for the construction of a new indoor sports stadium in Esperance to meet national and State competition standards and provide expanded and improved facilities for sporting activities, sports administration, temporary camping overflow and regional events. The new indoor sports stadium will also be used for major non-sporting events in Esperance including the annual Agricultural show. the Indoor Sports Stadium project budget is $7.8m, broken up into 2 stages. Stage 2 is $580k, which is the redevelopment of the Noel White Pavilion. Stage 2 has not currently received any funding, should no funding be made available Council resolved to underwrite the project. Additional storage space for users. During the planning process for the upgrades to the exisiting Indoor Sports Stadium some structural issues were identified. A review of the structure, Structural Strengthening of Esperance Basketball Stadium, was completed by Duncan J Jack, Consulting Engineer after concerns were raised during proposed extension works. The outcomes of this report directly influenced the planning process which led to plans that have now been endorsed and will commence construction late 2018. Concept plans for the redevelopment were completed in 2015 and detailed construction drawings have been finalised. These allowed accurate cost schedules to be developed - an essential inclusion for any grant application. Concept designs are now available for the New Indoor Sports Stadium Plan. A detailed design has been prepared by a local company, Wells Building Designers & Consultants. A final set of construction drawings will shortly be issued to the successful contractor. In February 2016 Council made the difficult decision to authorise the deconstruction of the Esperance Tanker Jetty. The Jetty was closed to the public in December 2015 after the Shire was provided with a structural assessment identifying several vital structural components that had either failed, or were about to fail, in at least four different locations along the length of the Jetty. Coastal Engineers recommended the immediate closure of the Jetty due to its unsafe condition. In February 2016 a Tanker Jetty Replacement Survey was conducted to obtain community input on what a replacement jetty should look like. The survey allowed diverse community opinions to be collected and analysed to assist in future concept designs and guide decisions that need to made for the benefit of the whole community. A summary of the Survey results can be found here. Following the survey two concepts were developed and showcased at the Esperance and Districts Agricultural Show on 14-15 October 2016. Information about the Replacement Jetty Concept Designs can be viewed here and a Concept Design Information Sheet, which summarises the concepts can be downloaded here. A third concept (restoration option) was developed by the Jetty Group Inc. was received by the Shire on 31 October 2016 and presented to Council on 8 November 2016 along with a Peer Review prepared by GHD and analysing the information provided in the Bonacci Infrastructure's Jetty Remediation Report and the BMT JFA Esperance Jetties Condition Assessments: Condition Assessment and Maintenance Strategy Report. The Agenda, Attachments and Minutes for the meeting can be viewed here. The Jetty Group Inc. delivered the Save Our Jetty Petition to the Shire on the 31 October 2016. The document was presented to Council at a Special Council Meeting on 8 November 2016. It did not meet the legislative requirements of a Petition; however Council acknowledged the local and regional interest in the Esperance Tanker Jetty. The Save Our Jetty Petition can be downloaded below in two parts. Throughout the past six years, a variety of reports have been prepared assessing the Tanker Jetty's structural condition. They have been provided below in chronological order. The Shire has always maintained an excellent working relationship with the Heritage Council of Western Australia (HCWA) and the State Heritage Office. 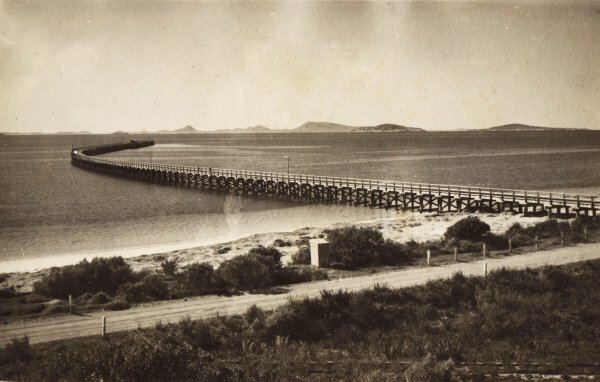 The Esperance Tanker Jetty was placed on the State Heritage Register in August 2008; its Register Entry is available on the State Heritage Website. After the decision to deconstruct the Tanker Jetty was made in February 2016, the HCWA was advised with the following submission and subsequently requested the Shire update the Heritage Interpretation Plan for Tanker Jetty to include the demolition of the structure and opportunity to provide for Interpretation of the structural footprint of Tanker Jetty as an archaeological site and inclusion of interpretation of the former town jetties into the proposed new jetty. During August 2016, the Minister for Heritage received a request to consider placing a Conservation Order on the Jetty and gave the Shire an opportunity to provide a written submission on the matter. The Shire opposed the proposed Conservation Order and provided this submission as a response. In January 2015 the Goldfields Esperance Development Commission (GEDC) received a report researching the infrastructure requirements of a potential cruise ship berth in Esperance including at the Tanker Jetty. This report included representation from Tourism Esperance, Southern Ports Authority (Esperance Port), Esperance Chamber of Commerce and Industry, Tourism WA and Shire of Esperance. The GEDC commissioned specialist coastal and port engineers M P Rogers and Associates Pty Ltd (MRA) to undertake a review of the current infrastructure available within Esperance for the berthing of Cruise Ships and also to provide some concepts that may optimise Cruise Ship visits to the region. The GEDC have approved this report be available for community members to see the full impact and potential costs of cruise ship infrastructure. Please note all costing information is on concept designs only. There has been much newspaper coverage of the Tanker Jetty through the years. You can find just some from the past 5 years here. At an Ordinary Council Meeting held on 27 March 2018 a tender for the Detailed Design Development for the New Esperance Jetty was awarded to H+H Architects. The Jetty Detailed Design Process highlights the milestone steps included within the project. The step coloured red is where we are now; this flowchart will be updated as we move through the process. The first stage of the Design Process is Stakeholder Consultation which includes Council, the Jetty Replacement Working Group, State Heritage Services and the Heritage Council of WA. The Tanker Jetty is a State Registered heritage asset and the design of the New Jetty will need to acknowledge its past significance. Director of H+H Architects, Julie de Jong, has answered some frequently asked questions about the design of the new Jetty, and how heritage values can be acknowledged. H+H Architects review the existing information about the Esperance Tanker Jetty and the replacement jetty so far. This includes the Tanker Jetty's history, survey and workshop results and structural reports. Following completion of stages one and two, H+H Architects entered the drawing room to develop a draft concept. Once the draft concept was completed it was reviewed by the Jetty Replacement Working Group and the Council after completing a 21 day commentary period where the Esperance community were given an opportunity to comment. The draft concept acknowledges how our social and heritage values were captured in the design while providing an indication of what the jetty will look and feel like. After it was endorsed by the Jetty Replacement Working Group and Council, the draft concept was developed into the Final Concept Design. The comment period was open for 3 weeks and invited the Esperance Community to provide input on the Draft and participate in a survey indicating if the design was acceptable. Two surveys were undertaken, one was a Control Group survey that was sent to 2000 randomly selected addresses of Esperance Residents and/or Rate Payers, the second survey was Opt-in, containing the same questions and available to everyone and anyone. The results in both the Opt-in and Sample Group surveys reflected overall support for the Draft Concept Design, with 79.5% in support from the Online and Hard Copy Opt-in Survey and 83.9% in support from the Control Group Survey. The number of valid surveys returned were 1096 Opt-in surveys and 403 Control Group surveys (duplicate surveys were removed and have not been included in these figures). The full results from both surveys are publicly available. H+H Architects have worked on the Final Concept Design based on the feedback received from the community. The Final Concept Design Report was presented to the Jetty Replacement Working Group and the Esperance Shire Council in January 2019 before going to the Heritage Council in February 2019. Many new elements were worked into the design as a result of the community survey and recommendations from the Jetty Replacement Working Group. This design was supported by the Heritage Council, the Jetty Replacement Working Group and Council and H+H Architects can now work on Developing the Draft Detailed Design. H+H Architects are currently working on Developing the Draft Detailed Design. This will then come back to the Jetty Replacement Working Group, the Esperance Shire Council and the Heritage Council of Wa before moving on to the Final Detailed Design. 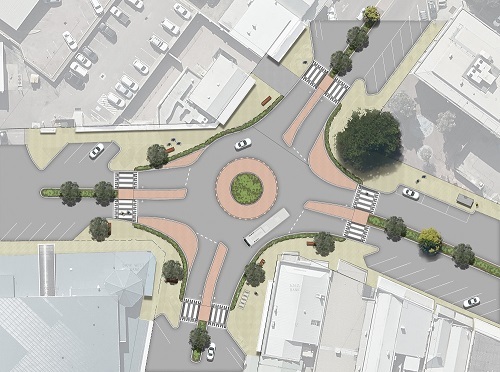 The Dempster/Andrew Street Roundabout is set to receive an upgrade to help improve safety and traffic flow for vehicles and pedestrians using the roundabout. What are the issues with the current roundabout? What improvements will this project achieve? Is this project costing rate payers? No, the project is fully funded under the National Blackspot Program. Why is this intersection a blackspot? There have been seven car crashes over the past five years with five of those crashes being right angle, commonly known as a T-Bone. The high number of right-angle crashes is of concern, as generally these should not occur at roundabouts. Can the money be spent on another project? No, the funding has been offered to the Shire for this project only. The National Blackspot Program prioritises projects and the funding would need to be returned. 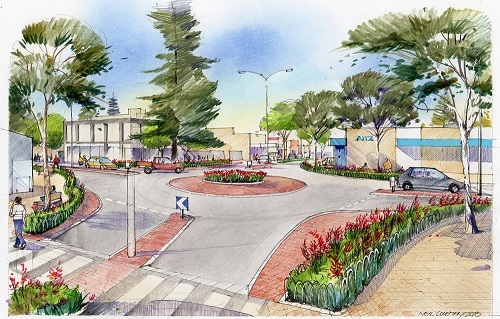 What will the new roundabout look like? The new roundabout will be similar in construction and size to the roundabout that is located at Dempster and James Street, this roundabout was upgraded a number of years ago. Landscaping will be commenced once construction works are completed and be combined with a landscaping project happening in Andrew Street.